There’s been much debate about the future of York city centre shopping, and shopping in general, and while we’ve been debating, individual shops in York have closed, others have opened. Some were long-standing family businesses, some a branch of a large chain of shops. There have been a few noticeable changes in the High Ousegate/Castlegate area recently. 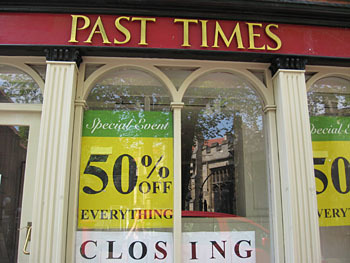 The York branch of the high-street chain Past Times has to get first mention, the name now appearing sadly ironic. At the height of its popularity – mid 1990s? – many gifts were bought here, and before Christmas it was usually uncomfortably busy. At the time of the Queen’s golden jubilee in 2002 its celebrations were featured in the local press, but it didn’t survive to celebrate the diamond jubilee, and is shown here at the end of May 2012. Another big name no longer part of our high street, and apparently now only trading from its London stores. Habitat had been in this impressive building – formerly Hardings – for decades. Looking around our house, I can see a lot of rugs, blinds, vases etc bought from this store. About 15 years ago we bought a kitchen unit from here, and getting it home highlighted one of the difficulties of city centre trading. They had no delivery service, the kitchen unit wasn’t something you could carry home or get on the bus with, and it wasn’t easy driving into the city centre and parking up at the Coppergate entrance to get it loaded into the car. As it’s such an impressive building, and in the right place, at the Spurriergate end of High Ousegate, it wasn’t empty for long. 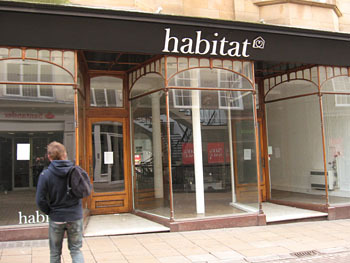 Urban Outfitters are now trading from here, with the shop pictured shortly before the opening of the store. Another welcome arrival, adding to what seems to be an impressive range of clothing retailers in the city centre. 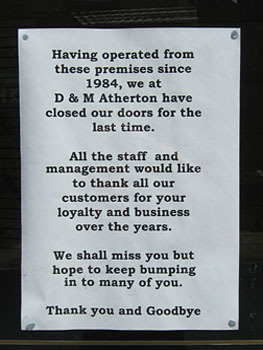 Just around the corner, on Nessgate, Athertons newsagent has closed. Not a national chain, a small family business. The lettering above the window advertised: ‘Confectioner, Newsagent, Tobacconist’. There have been wider changes which have no doubt affected sales in two of these areas of business, and then of course there’s Tesco Express. ‘Shopkeeper blames Tesco for demise of York family firm‘, said The Press headline. My Mum and Dad had the Nessgate newsagents and sold it to Mr Atherton. Started in 1966 and left in 1984. It’s been a newsagent for at least the last 60 years. Like the Athertons, they made many friends and Mum (age 92 now) passes the shop every week to collect her pension. Tony & Julie had a hairdressing shop upstairs. I have some unique jewellery from Past Times, its a shame it closed. York is a bit saturated with retro/vintagey/shabby-chic shops at the mo.